Why Comply with Occupational Health and Safety Requirements? In 1991, there was a tragic fire at the Imperial Foods chicken processing plant. A hydraulic line ruptured over a fryer leaving 100 employees to search for unmarked emergency exits, only to find that the owner, concerned about employee theft, had chained them shut. There were no fire alarms or sprinkler systems. 25 employees died and 56 were injured because the plant had been operating for 11 years without a single health and safety inspection. While most owners would never operate a grossly negligent plant like Imperial Foods, every owner can do a little more each day to keep their employees safe. Beyond simple employer responsibility, the dollars and cents of employee injury add up with workers compensation, damaged products and equipment, and wasted time. The best way to keep these costs down is to identify where injuries occur and fix the problem. The four biggest obstacles to OHS compliance are setting up your system correctly, proper employee training, preventative maintenance, and incident management. For each of these and more, Icicle offers integrated features that will help you maintain compliance and achieve excellence. Setting up an Occupational Health and Safety program is another way that Icicle makes regulatory compliance easy. Icicle is built with users in mind so that the features we deliver to you help you streamline your work, take advantage of automation and IoT technology, and ensure that everyone is on the same page. The first step of creating your OHS program in Icicle is to define Standard Operating Procedures (SOPs) and policies related to occupational health and safety. Through the Procedures section of Icicle, you can create procedures of all types, including Occupational Health and Safety procedures and policies. By creating them in Icicle electronically, you can disseminate these documents throughout your enterprise, even across multiple facilities. This allows you to create a single source of your information so that every facility and every employee always has access to the most current and accurate procedure and policy information – and you get to take advantage of all the other features in Icicle that connect with your dynamic procedures. You can also create teams in Icicle using the Teams tab. Teams have specific functions according to regulatory requirements and your organization’s structure. With Icicle, incident management tasks and other tasks can be assigned to teams in addition to specific individuals. Icicle’s OHS infrastructure begins with the team you create, including an identified OHS Officer. Teams need to meet regularly. Icicle’s Meeting Records organizes and records safety meetings as required by OHS regulations. Safety Officers can track attendance, keep minutes, and assign tasks to employees. Integrated with Icicle’s Task Management feature, employees are reminded of task deadlines until they are completed. Everyone tasked to the meeting, whether present or not, receives the information they need. Icicle’s Task Management feature makes it simple to assign tasks to employees, and Icicle’s alerts make it easy for employees to see what’s next for them. Through Task Management, leadership can literally watch the trickle of information flow and feel confident that when tasks have been checked off, the word is truly out. 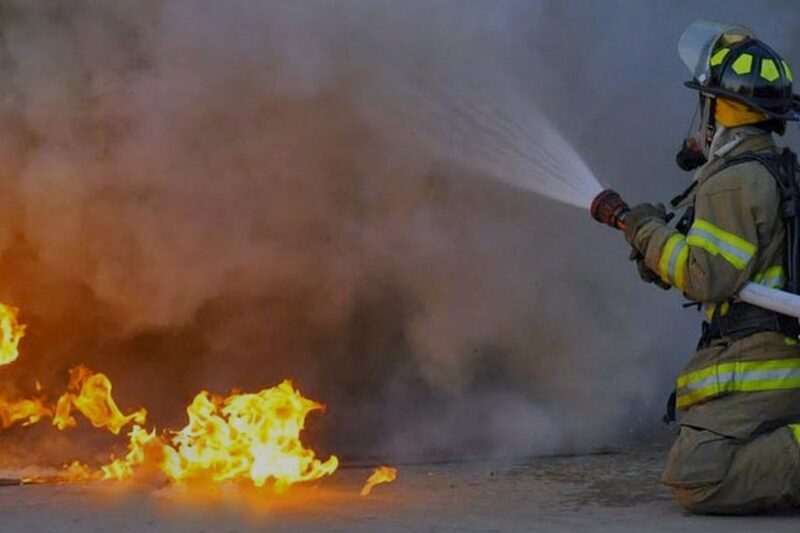 Safety Officers can also input safety procedures as tasks to reinforce training and confirm that precautions are being observed. Icicle’s Employee Assessment feature gathers information like training and experience in an employee profile, helping managers calculate risk when assigning tasks or assembling teams. When an employee receives training, it is added to their profile from which management can verify the status of every employee to ensure the information was disseminated. The ability to conduct employee assessments with this level of detail and documentation can reap many rewards. Next time your government agency shows up and reviews your assessment records, you might get a reduced rate and minimize insurance costs. The safest procedures are useless if employees are not properly trained. High turnover and language barriers are huge obstacles to maintaining a well-trained workforce. To ensure that training takes place and that the correct employees with the correct training are assigned to tasks, Icicle has you covered. For each procedure document in Icicle, you can indicate which user was trained, on which date, who delivered or verified the training, and assign a duration to the validity of the training (or schedule a refresher on an annual basis, for example). This replaces enormous spreadsheets to mark which employees are trained for which procedures. Instead of a huge headache, Icicle automatically sends out reminders and schedules training in advance. Every morning, you get an email that tells you outstanding tasks, including training tasks. You can immediately see which tasks are overdue and how long they’ve been sitting. There is no longer a need for you to stress about remembering to update a document or make sure someone else completes a task. Attending a training session once doesn’t do much if your employees have been with you for years. It’s important to refresh and update information on a regular basis. 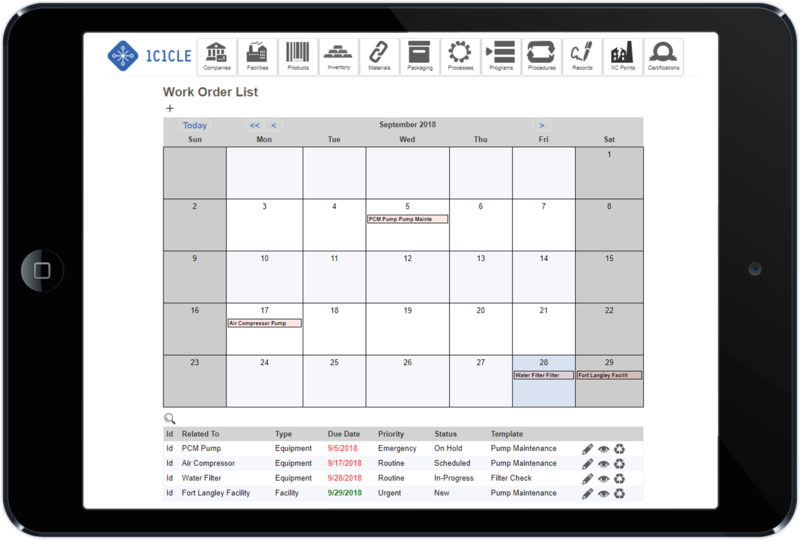 Keeping track of this can be hard, but Icicle easily allows managers to schedule regular training sessions according to procedures. When you access the user interface, you can easily see which users have which training. You can schedule refresher training on an annual basis (or according to your need; for example, every other Tuesday) from the procedure detail page. A 2015 study showed that food industry workers have a 60% higher rate of illness and injury than other industries – mostly due to slips, trips, and falls. 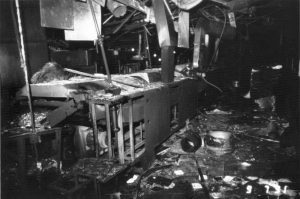 The Imperial Foods fire in 1991 was caused by a simple equipment failure that should have been caught sooner. The best way to prevent injuries, from slips to dangerous equipment failures, is with organized preventative maintenance. Icicle organizes preventative maintenance to comply with Occupational Health and Safety for you through three sophisticated features. Icicle’s Equipment and Maintenance Management feature keeps production equipment and safety equipment (like eyewash stations) in safe working order. Repeating schedules are managed so that work orders can be generated and parts inventory tracked. This feature keeps maintenance personnel and managers on the same page – a critical relationship for OHS. Icicle’s innovative Internet of Things (IoT) functionality connects Icicle to equipment sensors, collecting and securely sharing data such as temperature, chemical concentration, and flow rate. The data is logged in Icicle’s logging system and setpoints will cause the system to send alerts when critical or operational limits are exceeded so managers can take corrective action before an injury occurs. Although Icicle’s Laboratory Management feature was created to streamline food safety testing, air and water test results may also indicate an unsafe work environment. Exposure control devices, like all equipment, lose functionality. For example, some artificial flavorings used in baking, coffee, and popcorn production have caused obliterative bronchiolitis, commonly referred to as “popcorn lung.” Regularly testing the air in facilities using this artificial flavoring with electronically returned test results can notify the Safety Officer if immediate action is necessary. Employees could wear respirators until faulty exposure control devices are repaired. A combination of well-organized maintenance tasks, automated sensors with alerts, and regular environment tests are all preventative maintenance measures that create an OHS compliant workplace. Reporting incidents – whether something that happened or something that almost happened – is also a crucial part of Occupational Health and Safety. That information is valuable to your operations and is also required by regulatory bodies. Icicle includes reporting tools that help companies create compliant OHS records and go even further to manage incidents according to regulatory requirements by enabling users to define and assign corrective actions (with deadlines) and undertake root cause analysis. 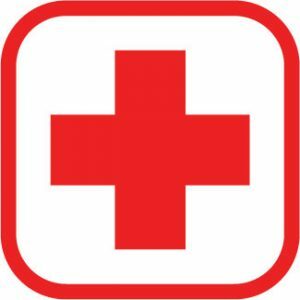 Icicle’s First Aid Incidents feature makes properly documenting an injury easy. As part of Icicle’s incident management infrastructure, the reports are available to the Safety Officer and management. These reports include details, like witnesses and physicians, that validate workers compensation claims and satisfy OSHA’s injury report requirement. Safety Officers can create templates for frequently occurring injuries and input immediate corrective actions, minimizing impacts on production. Icicle’s Near Miss Incidents feature allows employees to document incidents that could have resulted in injuries. These reports come from first-hand employee experience and may include hazards the Safety Officer overlooked. Both First Aid and Near Miss Incidents provide valuable insight into injuries and their causes, allowing management to make strategic changes to prevent further injuries. This includes the updating of records, whether it be new employee training or updates to the procedures (in cases where employees conformed to the procedure when the incident occurs). When changes occur, you can quickly check to see which employee needs new training based on revised procedures. Why Choose Icicle for OHS Compliance? It’s no longer possible to achieve Occupational Health and Safety compliance with paper records; OSHA now requires injury reports to be submitted electronically. A technological, flexible, big-picture solution is the only way to keep up with regulations, and whether you’re a food product or an employee, Icicle was designed with your safety in mind. Icicle features that improve occupational health and safety integrate seamlessly with safe production and business features, saving management time while improving accuracy and communication across the board. The health and safety of employees is a serious responsibility, and you need a seriously intelligent food manufacturing software to help you out. Request a demo of the Icicle food manufacturing software today! You can also learn more about how Icicle works here.